The Bills are off to one of their best starts in years, with a 3-1 record. That includes wins over the Denver Broncos and Atlanta Falcons, two of the better teams in each conference. This week the Bills travel to Cincinnati to take on the Bengals Sunday afternoon. 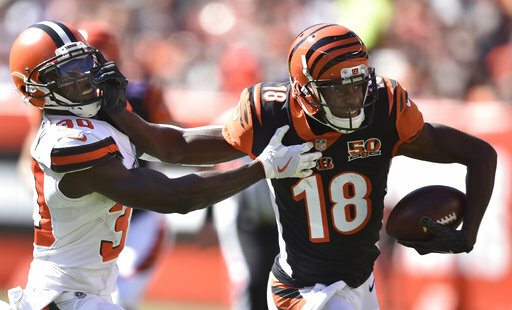 Cincinnati got off to a slow start, losing their first three games to Baltimore, Houston and Green Bay before having a breakout win at Cleveland last week. The Bengals put up 31 points in that game and now want to show the home crowd that they are much better than originally perceived. Cincinnati is always one of the better coached teams in the NFL and they have some play- makers on both sides of the ball. So this is a game the young Bills cannot get to over confident about. If that happens they will come home with a loss! Quarterback Andy Dalton gets a lot of heat from both the Cincinnati media and fans, but I have always felt that he is a very smart quarterback. He has some limitations, but he can beat anyone on any given Sunday. He may lack special traits but he can get the job done. The ground game is not what the Cincinnati coaches and front office thought it would be. I never felt first round pick Joe Mixon was as “special’ as many draft analysts thought he was. He is a good solid all all-round player who is capable of having a big game, but he is not special. The backups Giovanni Bernard and Jeremy Hill are talented players who have the skill-set to start for many teams in the league. The depth of the Bengals backfield might be the best in the NFL. At wide receiver, Cincinnati has one of the better wideouts in football. A.J. Green is tall, long, fast and athletic and is capable of beating any defense, long or short. Opposite Green is Brandon LaFell, who has been an NFL journeyman and has never quite lived up to expectations. But don’t count him out, as he can come up with a big play. First round pick John Ross, the speedy receiver from Washington, hasn’t played yet due to injury. If healthy, he becomes an instant deep threat. Bengals tight end Tyler Eifert has missed the last two games with injuries. Eifert has some special to him, but his entire NFL career has been slowed by injuries. Even if he plays, I doubt he will be 100%. The offensive line is coached by Paul Alexander, who is regarded as one of the better O-Line coaches in the NFL. His group may not have any Pro Bowlers, but they are a consistent run and pass blocking unit. On defense, the Bengals play a 4-3 scheme and the defensive line is one to be reckoned with. Defensive tackle Geno Atkins is one of the best 3-techniques in all of football and has to be double teamed to be controlled. Carlos Dunlap and Michael Johnson are two tall and long edge rushers. While they may not be quite as good as they were earlier in their careers, they can be difficult to handle one on one. The Bengals have been looking for the right Mike (middle) Linebacker for years and may have found him in Kevin Minter, the former Arizona Cardinal. Minter is very instinctive and plays the run and pass equally well. Second year man Nick Vigil is the Will (weakside) Linebacker and he is having quite a year. Through four games, Vigil leads the Bengals in tackles with 34. Vonteze Burfict is the Sam (strongside) Linebacker and while he isn’t a top athlete, he is instinctive and very physical. He is always around the ball. Like the rest of the defensive unit. The Bengals secondary is solid. Through four games they have given up only 742 yards in the air and opponents are completing only 58% of passes thrown. They can’t be underestimated. What do the Bills have to do to win? Keep doing what they have been doing for the first four weeks. Play physical, mistake-free defense and create turnovers. On offense they have to continue what they did last week and that is get Tyrod Taylor on the perimeter so that he can be more effective and play to his strength. During the preseason, the Bills were a mistake-prone team that got a lot of penalties. That hasn’t happened in the regular season and that type of disciplined play has to continue for the Bills to keep having success. This is a winnable game, but only if the Bills plays hard physical football and limit mistakes. It would be nice to be 4-1 after five games! Greg Gabriel’s 30 years of scouting and NFL front office experience are now a part of Buffalo Sports Page. Follow him on Twitter @greggabe and read his Bills analysis here.